Over-laminate Film - Daiwakaseishoji Co.,Ltd. In inkjet printing, over-laminate film is unified with printed mater and cannot be omitted excluding exceptions. The main reasons to use over-laminate film are adjusting of gloss on the surface of printed matters, improving weatherability, protecting rubbing. As the over-laminate film plays an important roll in function, careful consideration is required in the choice of over-laminate film. 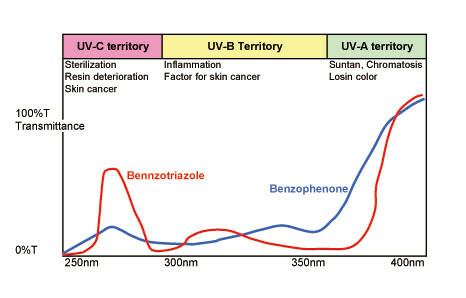 Generally, Benzophenone, Bennzotriazole, Cyanoacrylate, Salicylate are well known as UV absorbent, our film combines the feature of each substance. Thus our film can protect 99% of UV wavelength, preventing deterioration, improving color fastness of daylight for ink and media overall. 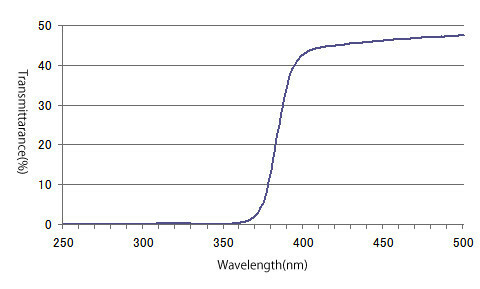 Broad Tack-mate (PVC UV) has the property of UV absorption as below. It will be suitable for outdoor use. ※In case of outdoor using, please be sure to combine Broad Tack with UV CUT (Over 98%) film. You can reduce wastage from your factory as separator is not used in Non-Sepa Series. Not only PP but also other base materials are available. But produced on order and needs to be discussed in advance. Non-Sepa is registered trade mark of Daiwakaseishoji. You can also contact us by mail website inquiry. For your inquiry, basically we will reply within one working day. With regard to inquiry received after 18:00 PM, on Saturdays, on Sundays, on holidays, we might reply after one working day. Copyright Daiwakaseishoji Co.,Ltd. No reproduction or republication without written permission.